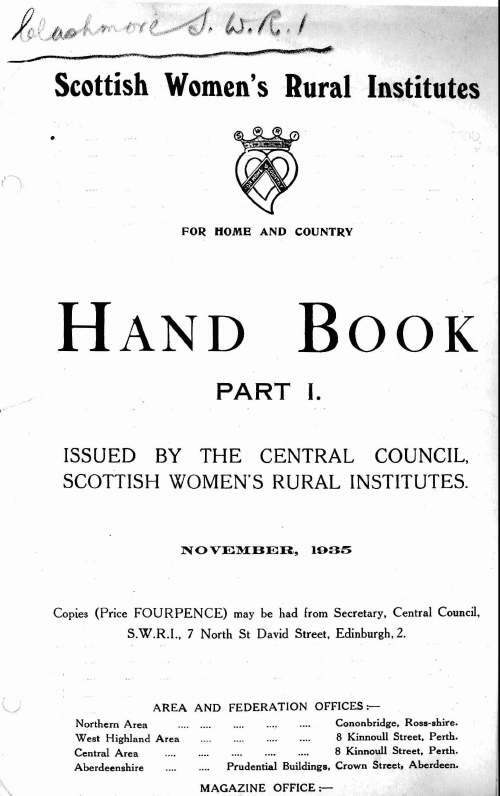 Copy of Scottish Women's Rural Institutes Hand Book, issued by the Central Council in November 1935. The 23 page document covers the Constitution and Organisation, Institutes, Annual Elections of Office Bearers, County Federations, Areas, Central Council, Committees, National Conference, Finance and detailed Notes for Institutes concerning the conduct of their business, hints for work, specimen programmes, competitions and suggested subjects for lectures, demonstrations, exhibitions etc. The hand book ends with a list of publications and details of the magazine, stationery, badges and copies of Institute Songs available from the Central Council Office.